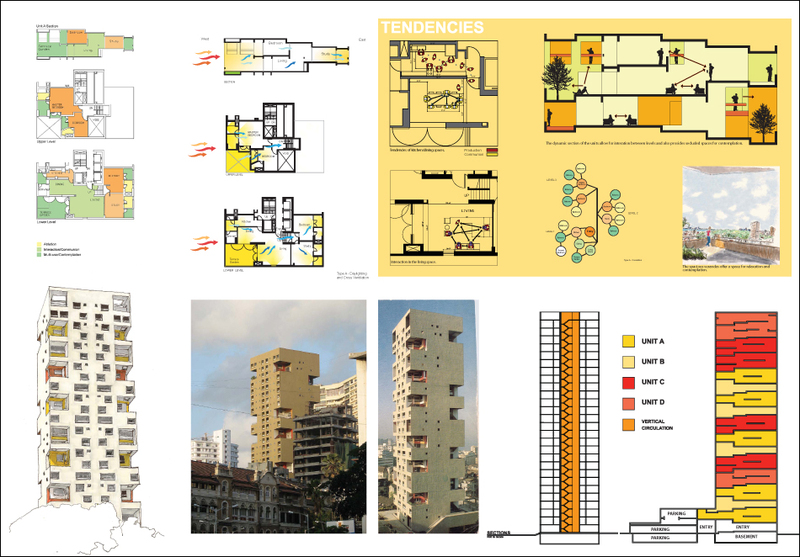 Our term project for this quarter was to be a 26-unit housing and retail complex in Silverlake. As usual, we began the quarter with a case study of well known housing solutions. Our investigation was to extend past the usual aesthetic and semantic evaluation and was to include an evaluation on the type of space and how usable it was by its inhabitants. 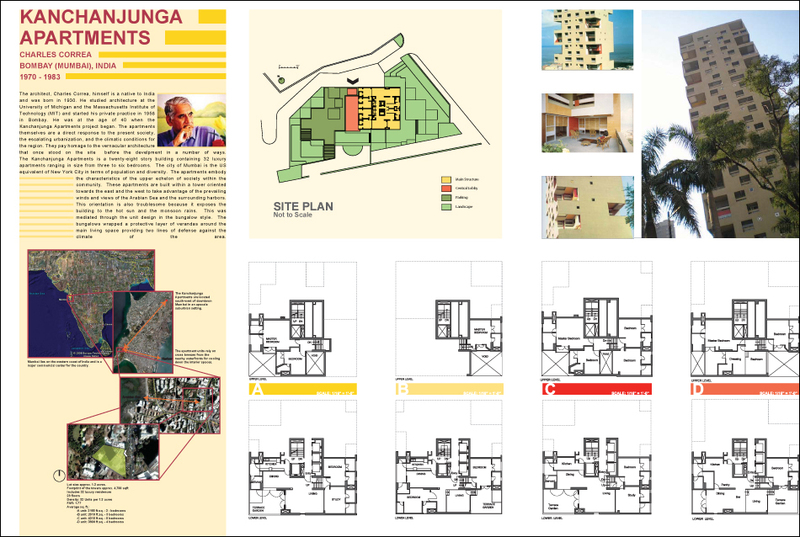 We selected to do a case study of the Kanchanjunga Apartments in Mumbai, India by the architect Charles Correa. We were first attracted to this project because of its intriguing presence; it looks like a bunch of over-sized puzzle pieces. In fact, it is organized as a bunch of puzzle pieces. Traditionally, Indian housing had large planted verandas not only to help keep houses cool, but also as buffer for the home in the event of a monsoon or heavy rains. Correa provided each of the 32 units with double height, plantable veranda oriented east-west to maximize natural ventilation from ocean breezes. To accomplish this, Correa created a complex geometric system of about four standard units (2 – 5 bedrooms) which would interlock vertically in a way that would allow for each to have a large veranda. The result is a building that is incredibly intricate in section. Below are the two boards we presented that I was able to salvage and a short animation attempting to simplify the complex geometric configuration. Each band of color represents one type of unit. Click on the images of the boards to see the full size PDF’s. Collaborating on this project were Roxanne Stewart and Jennifer Clare. Board One. Click for PDF. Board Two. Click for PDF.